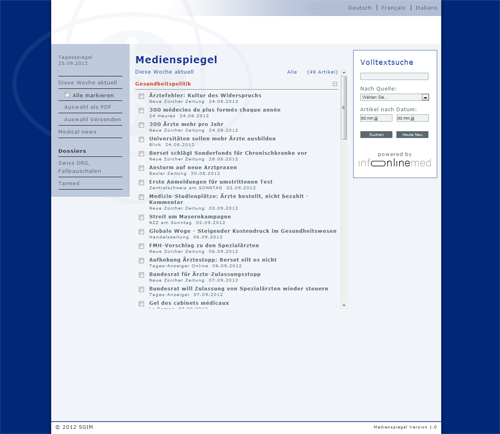 This is an over 10 years ago designed, extensive and continuously developed content management system. 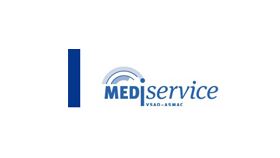 The features of the CMS are articles and headings management, asset management, a fully integrated multimedia streaming management with interfaces for content delivery networks (CDN) like Akamai, newsletter engine (80k mails per week), shop and much more. 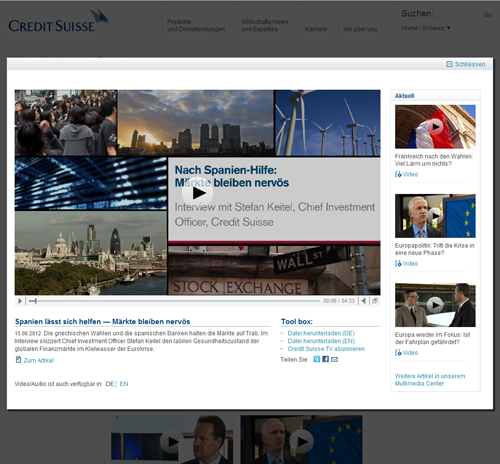 Some notable clients such as the Credit Suisse Online Magazine "Infocus" are build with this CMS Jamez. 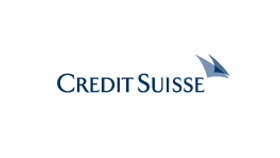 Infocus is the Credit Suisse online magazine based on CMS Jamez including Accessibility AA + certification for the entire Credit Suisse Infocus appearance. 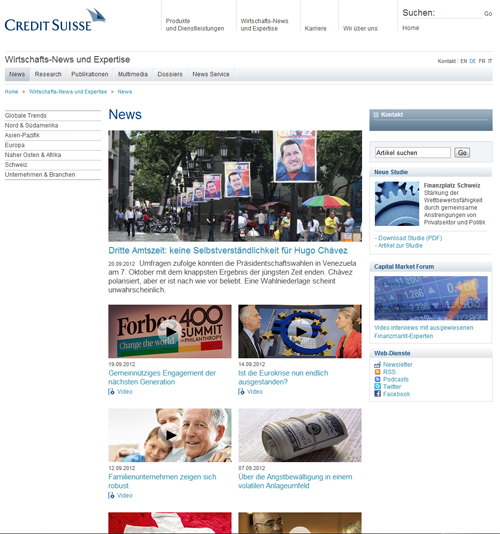 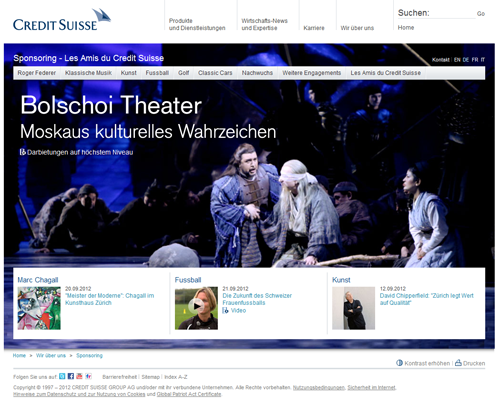 This is the online magazine of Credit Suisse with weekly news, videos, audios and photos. 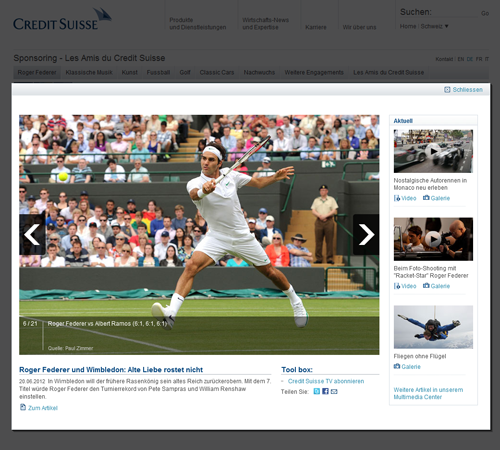 In the Credit Suisse Media Center is all media content of the Credit Suisse available (video, audio and picture galleries). 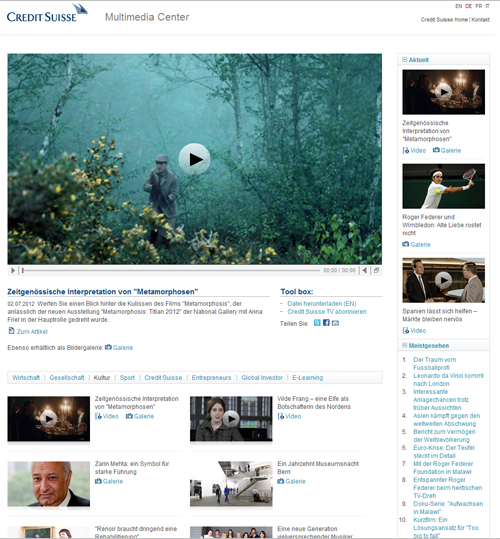 The Video Player of the Mediacenter is based on the OSMF (Open Source Media Framework) and is developed using Adobe Flex / Flash (ActionScript 3). 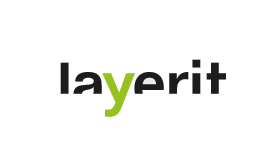 The video (h.264) or audio (mp3) content are delivered by the CDN (Content Delivery Network) Akamai and depending on the browser and device, the player switches between a Flash or HTML5 version of the player. 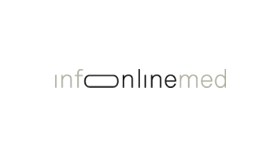 Infonlinemed is the daily updated online media service for healthcare professionals. 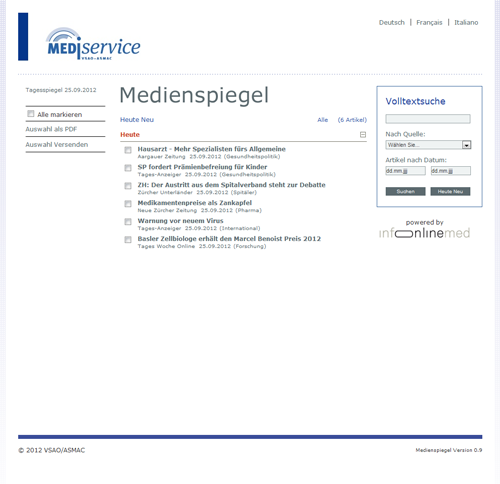 New enhanced is a personal version of the online service, which was developed to manage pressreview content quickly, share with employees or send these articles as a PDF. 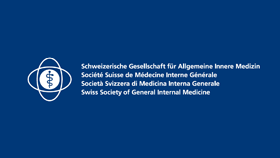 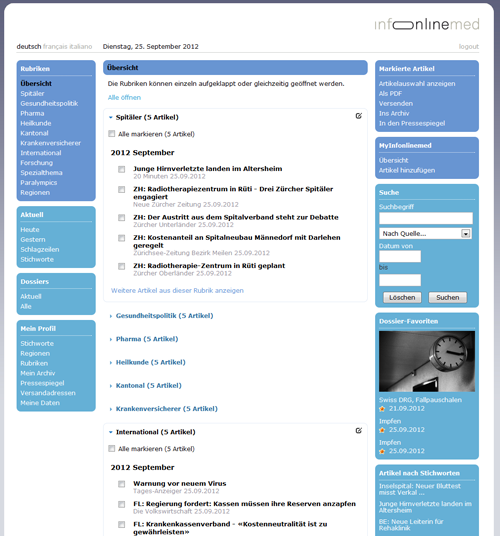 Individual healthcare pressreview application based on Infonlinemed. 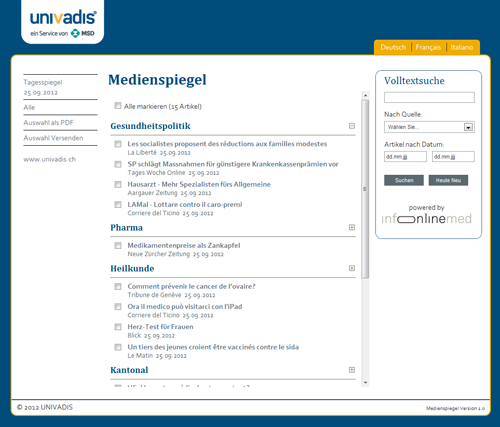 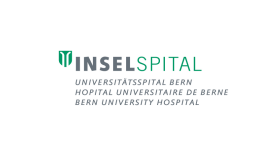 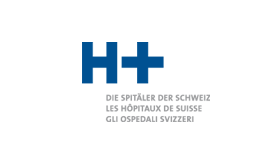 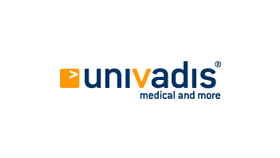 The customization and collaboration solution of the health-pressreview is based on Infonlinemed. 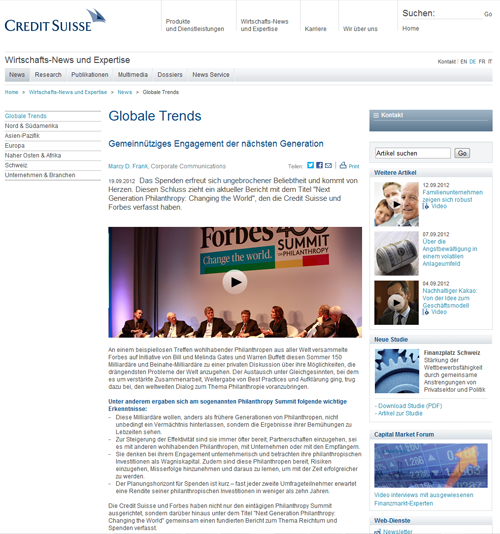 These customized content can be shared and published with a PDF / Email module, across the enterprise. 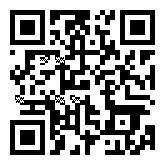 With this web app one can on an administrator website collect addresses in groups including geo-location information. 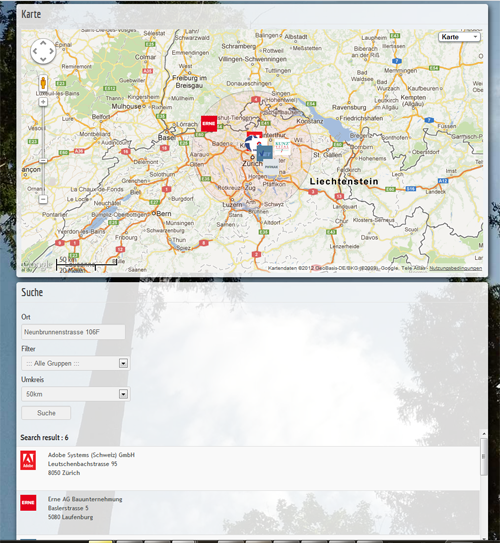 On the website a Google Map will be integrated, on it you search in a certain radius for the collected addresses or for your favorite data.